Gangding Business Zone of Tianhe District is very famous in computer and IT (Information Technology) industries. Actually, Gangding is the extension of the Tianhe Business Center. 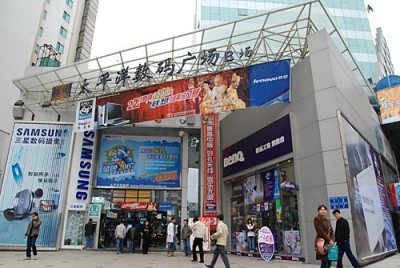 With the Pacific Computer City, Galaxy Computer Plaza and other commercial units won great success business in this area, Gangding became a unique business center dealing with computer and IT products. In addition, many stores, spa, restaurant and entertainment venues gained ground in Gangding including Shi Pai Dong Lu Shopping Street, Galaxy Cinema, California Red Karaoke Box, etc. More and more visitors from the city as well as from all over the country shop around in Gangding business zone. Gangding became one of the busiest shopping areas in Guangzhou city.